2011 will be an exciting year for the Ottawa region. The city will play host to a triennial global feminist conference - Women’s Worlds. This distinguished international and interdisciplinary event will bring together hundreds of academics, advocates, researchers, policy-makers, workers, activists and artists of all ages from around the world. In 2011, the conference celebrates its 30th anniversary and is poised to be the largest women’s conference in Canadian history. The goal of Women’s World is to tackle a wide range of issues including violence against women, health, education, security, sexualities, poverty and the economy and to create an environment where participants from diverse backgrounds can exchange ideas, debate and inspire change. Women's Worlds organizers have announced a call for participation, inviting academics, community leaders and any individual, group or coalition with ideas, research and stories to submit a proposal under the theme of "Inclusions, exclusions, and seclusions: Living in a globalized world". The organizers are deliberate in their language –launching a call for ‘participation’ rather than ‘papers’ to stress that the conference is meant to build bridges between the academy and the community, to combine knowledge and practice and embrace diversity. Proposals will be accepted in French, Spanish, or English via the online form at the Women's Worlds 2011 website until September 15, 2010. Find out more at www.womensworlds.ca. 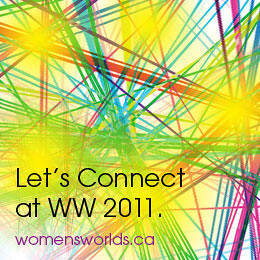 Women’s Worlds will be held from July 3 -7, 2011 at the University of Ottawa and Carleton University compuses. Interested individuals can stay informed via e-bulletin, facebook, flickr and youtube and spread the word by downloading and utilizing a variety of tools available on the trilingual website – www.womensworlds.ca. I'll also keep posting news on the conference here on the Fedcan Blog. Stay tuned!